You've come to my website, because you or someone you care about is in need of legal help in Washtenaw County. There's generally three type of charges in Washtenaw County: traffic offenses, misdemeanor and felony. A drunk driving offense is both a traffic offense and either a misdemeanor or felony. All cases begin at the district court level no matter the level of charge. A misdemeanor starts and ends at the district court while a felony begins in the district court for preliminary examination, which are held on tuesdays and thursdays at the 14a-1 District Court. These cases are presided over by the district court judges. The District Court judges in Washtenaw County are Judge Hines, Valvo, Burke, Pope, Tabbey, Conlin and Simpson. If the case is bound over to the circuit court, the case then goes to the 22nd Circuit Court for further proceedings. The Circuit Court judges in Washtenaw are Archie C. Brown, Patrick J. Conlin, Timothy P. Connors, Carol Kuhnke, Darlene A. O'Brien, Julia B. Owdziej and David S. Swartz. I handle all three types of cases in Washtenaw County. 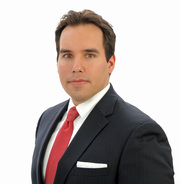 I'm currently the co-chairman of the Criminal Law Section of the Washtenaw County Bar Association where I educate fellow criminal law attorneys in the county on all relevant and new legal issues, which could impact our clients. We've planned and hosted many events with legal experts, county judges and the Washtenaw County Prosecutor's Office. I also contribute to the Res Ipsa Loquitur, which is the official bi-monthly publication of the Washtenaw County Bar Association. 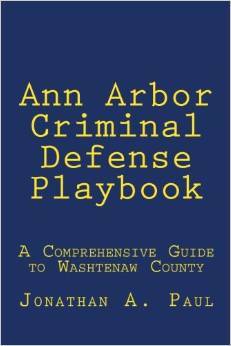 Criminal cases in Washtenaw County have four outcomes. Your case could be dismissed due to suppression of evidence or unavailability of a witness, you may enter into a negotiated plea agreement to a reduced charge with a sentencing agreement, which keeps you out of jail, you may go to trial and be found not guilty or you go to trial and you're found guilty. So how do I get you the best outcome for your case? As a former New York City and Michigan prosecutor I know both sides of this system, and I know what gets results. My method of criminal defense is unique in Washtenaw County, because my clients take a proactive approach rather than sitting back and simply hoping for things to go well. This approach has worked very well in Washtenaw County for various criminal charges, especially drunk driving, retail fraud, domestic violence MIP and drug possession cases. I don't publish the secrets to my approach on my website, because other attorneys would steal it for their clients, and my clients would no longer have a distinct advantage. My approach in Washtenaw County has sometimes resulted in better bond conditions, less or no alcohol/drug testing, dismissal of charges, avoiding jail, shorter probation terms, keeping a driver's license, lower fines and costs and a number of other benefits. My clients get great satisfaction knowing that they can have a positive influence on their case both inside and outside the courtroom. I always ask my clients if they want to strive for an average or an exceptional result. If the potential client wants to settle for being average, I will pass on the case. When you're charged with a crime in Washtenaw County you're unfortuantely already considered a criminal by the court, prosecutor and police department. Your case and file have no face, history, background or information other than the crime you're alleged to have committed. No wonder most judges and prosecutors only think of you as a criminal who deserves to be punished. I know that's not the case, but we need to convince them of the same thing. It's my job to be your biggest fan, and promote all the positive things in your life and background. Based on my experience, I compare the police department, prosecutor and court to a powerful and rich casino with all the resources and power to take advantage of you. The casino has the house advantage, and potential clients are fighting an uphill battle without the proper education and game plan. I empower my clients to take back the house advantage, and even up the score, or even get an advantage over the casino. This is where my game plan takes over, and begins to turn this vicious cycle around. On my plan, which I like to compare to a boot camp, we create positive currency to counteract all the negative vibes around your case. Do good honest people make mistakes? You bet. Does a judge or prosecutor think you're actually a good person who deserves a second chance? Right now - NO! .... you don't get the benefit of the doubt by simply showing up in court. Even if your attorney says how wonderful you are, those words are cheap, because any good attorney is going to speak well of his/her client. A court and prosecutor want real action! This is what we do as a team. We develop a specific game plan tailored to your case and your background in order to present you as the good and honest person that you are - a good person who made a mistake or had a lapse in judgment. Without doing this a judge may think you need to be taught a lesson by going to jail, or the judge can't trust you not to drink or do drugs, and wants to test you twice a day on your own dime. Your license may be taken away or you might be allowed to be in your home with your spouse or kids. Wouldn't it just be easier to start a program before even going to court in Washtenaw County, do well on it, and ask the judge to just continue allowing you to do that rather than what he had in mind for you? It's like creating your own punishment as a kid and having your parents accept it rather than them coming up with their own terms. By being proactive outside of the courtroom, it helps when you get in the courtroom in Washtenaw County. I provide the tools to accomplish your goals. What if I'm innocent and don't think I should have to do anything? Despite your constitutional right to be innocent until proven guilty, the judges in Washtenaw County is still going to give you bond conditions, and can keep you in jail during your case, and locked out of your home. Just being charged with a crime allows the court to have total control over your life until your case is concluded. My plan puts all of my clients in a better position during their case, allowing the opportunity for favorable bond conditions, because we're taking control of the situation for the judge. Doesn't it just sound better, and makes you feel a little better if we can tell a judge you're attending AA meetings voluntarily, alcohol and or drug testing, meeting with a counselor and doing community service rather than a judge yelling and screaming and telling you that you need to go? What about showing the judge a negative alcohol or drug test, instead of promising you'd pass a test? Most clients feel better about themselves about going to court when they are already being proactive about their case. This approach relieves the stress of the unknown, and puts currency in your account with the judge and prosecutor before even stepping into the courthouse. If you're looking to travel or ask for special consideration during your case, you bet you'll want that currency ready to use on the day of court. It's the difference between studying for an exam and being confident versus just showing up and hoping something good happens. You'll enter court confident and ready to face the judge and prosecutor. During this proactive approach, we're also exploring every single defense to your case as a team. If the case can be defeated or won at trial, that is what we do. I've been a prosecutor in New York City and here in Michigan, if trial is your best option, we will go ahead and go down that path. If we decide as a team that the cons outweigh the pros in pursuing that approach then our proactive approach is already in place, and your case is in a better position to be reduced, dismissed or some other favorable outcome, which may not have been possible without being proactive from the very beginning. A judge and prosecutor in my experience are going to look a lot more favorably on giving a client the benefit of the doubt if they are already doing things during their case. How can you apply to be one of my clients? No that's not a typo, potential clients must apply for my legal services. My services are in high demand for Washtenaw County, and I cannot represent every person that contacts me. I have to turn down around half of all potential clients that call or email me, because I'm either fully booked with my current clients or your case may not be the best fit for my law firm. I carefully select clients who are committed to following my game plan, and want to better themselves going forward. If you simply want to show up and hope for the best, I can give you the name of another attorney who will take your money. When you contact me today, I'll want to know what crime you're charged with, where it happened and some background information on yourself. I want to know your goals and whether or not this is your first contact with the law. I use a basketball analogy to describe my approach. We call a timeout, regroup and put forth a well thought out game plan, which results in an efficient and successful score on the offensive end. We don't sit back on our heels and play defense hoping not to lose. We work with the strengths of your case, and spin the negatives into positives. As you read this, you're worried about going to jail, having a criminal record, losing a driver's license, and possibly losing a job, student loans, being kicked out of school or even being deported from this country. Let me take that weight off your shoulders by explaining to you my method for defending your case. I promise that you'll feel better after speaking to me about your case and your goals. You will have a game plan in place, and will be actively involved in influencing the outcome of your case. The average client feels isolated and helpless when charged with a crime; my clients are involved and actively doing things every day to improve their position and their future.